First off, I’d like to say that house maids are not indispensable. With proper household management you can pretty much handle everything with the help of your hubby and children or other people that live with you. But should in case you can’t avoid it right now, how do you manage a house maid living with you, especially when you have your husband who is a full blooded Nigerian man that can get tempted? (If you are thinking he is a pastor, aunty forget that one, me sef I’m a guy). 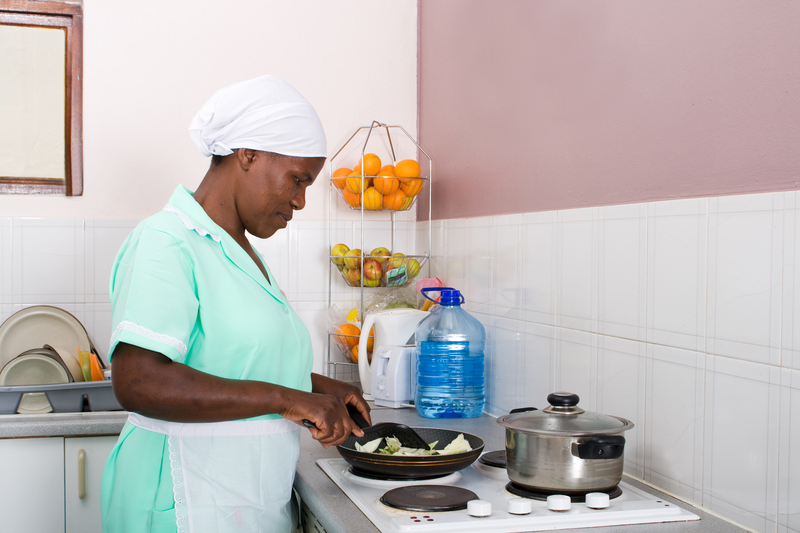 I would be sharing six tips on managing your housemaid that you should pay attention to if you want to have a lasting marriage and a peaceful home. It’s an employment contract, not a mother-daughter relationship. As you soon as the maid is hired, make sure that they fully understand what it expected of her. Most house maids are smart, they have been at domestic housekeeping for a while, so they can always tell when a house mistress would be tough or easy. Or fire. Right from the first meeting, if you can detect certain vibes of not being able to control her, aunty, don’t even bother to bring her into your home. I have literally seen how bad it can get when there are two Ogas in a home. Na serious problem. And when they start to misbehave, please don’t hesitate to send them packing. Don’t worry you’ll survive without them…at least until you hire a new maid. To avoid all forms of trouble, now and later, please make provisions for a room in which only the maid would stay in. Avoid letting her sleep in the living room or corridor so that should in case your husband is passing by he doesn’t catch a glimpse of what he should not see which would lead to things that shouldn’t happen (clears throat). Unlike when you used to sweat it out alone, you cannot afford to leave your valuable properties lying around the house. Phones, jewelleries, money, exotic attires etc. should be tucked away from the prying eyes and light fingers of the maid. It is better to prevent a thing that to cure it. This one you won’t be able to cure including a maid that steals. The only cure (if applicable) may be to fire her. No matter how homely, hardworking, or whatever the maid is, don’t make the ghastly mistake of becoming nice and all. Don’t me wrong here. I mean that you should keep a balance between being nice and being stern. People have the habit of going a hundred miles when you give them an inch. Your house maid is not your daughter. She is your employee. This also includes not giving her your old clothes that your husband may find appealing on her. Keep that in mind. Does your husband have an Achilles’ heel for large bosomed ladies? Then avoid hiring a maid with such. Is she very attractive? That’s a no go area considering men’s tendencies. Are all your children males? Then only hire a male maid. Are they all females? Likewise only hire a female maid. This is all common-sense. If you found this article as a great read, please share and comment! Thank you! My ASD Story: With All The Doctors Appointments, The Diagnosis, The Judgmental Stares And Unkind Words......Yet My Son Triumphs. Nice article you got there but I don’t think giving out old outfits which are not too revealing to a maid is wrong some of these maids are dirty and wear dirty old looking clothes in a case where the maid gas to baby sit atimes she needs to be clean…so I think giving out clothes but not revealing ones us not a bad thing to do.